I was very fortunate to have the opportunity to attend Aero Camp at A2 Wind Tunnel in Mooresville, NC hosted by Brian Stover and Heath Dotson. The main goal that I hoped to achieve was riding the 112 mile Ironman bike course on less watts without losing any time. I expected to ride the Ironman Louisville course around 5:20 on 200 average watts. 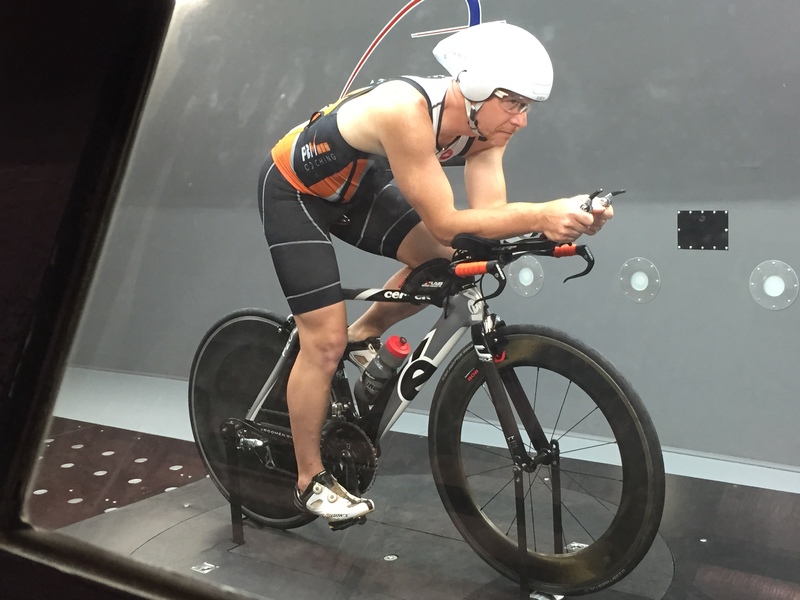 Here’s my account of what I learned while spending 2 hours in the wind tunnel with a couple of aero wizards. First a bit about me. I did my first Ironman in 2009 and have been gradually transitioning from participant to competitor. Coach Kurt Perham and I started working together in 2011 and my times started drifting towards the mid-ten hour mark. In order to continue to improve, I know that every detail must be accounted for. Aerodynamics is no exception. It’s not cheap. Two hours in the wind tunnel cost $1000 and I was fortunate to be able to drive so all-in I was right around $1200. That’s a crap-load of money… or is it? Triathlon is not an inexpensive sport. Bikes can cost well over $10k, entry fees for Ironman are just shy of $1k not counting hotel and other travel expenses. The most expensive aspect of triathlon is time. Depending on the time of year, I train between 12 and 20 hrs per week. Can’t really put a price on that. There are a lot of aerodynamic bits on the market that you can buy for your bike. Deep front wheels, disc rear wheels, aero helmet, skin suits, aero bottles, etc. Within each component, there are a multitude of choices and none of them are inexpensive. Generally speaking bike components can be measured against each other to determine the fastest individual component with reasonable transference from one bike/person to another. 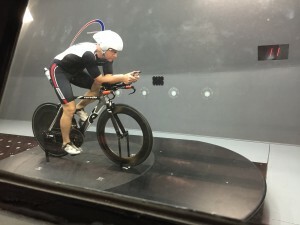 The voodoo science comes in when we talk about aero parts that interface with the human body like suits, helmets, etc. Brian Stover has plenty of data points to show that the fastest helmet for one person is not necessarily fast for everyone. There are certainly some trends; however, when it is time to spend $300-$500 on a helmet wouldn’t you like to get the fastest option for your melon? Additional voodoo science is at play with the body position on the bike. For example, some people are faster with their hands rotated up. Some get slower with a lower base bar position. I was moderately interested in minor position changes since they can come at a price. Sometime the most aero position is not sustainable for 112 miles. It may also not be the most efficient from a power output standpoint. I had a solid 2 months before my race so I knew I could adapt to minor position changes without issue. I arrived for my session about 20 minutes early to allow time for Brian and Heath to prep my bike for the tunnel, get changed and fine tune our plan of attack. I was instructed to try to maintain the exact same position and watts throughout the entire 2 hour session. Brian let me know that we’d likely get about 12 runs in so we needed to be smart about what we tested. Every second counts in the tunnel so it is very important to be prepared and committed to testing a finite set of options. We started with a baseline and then started working through the list. 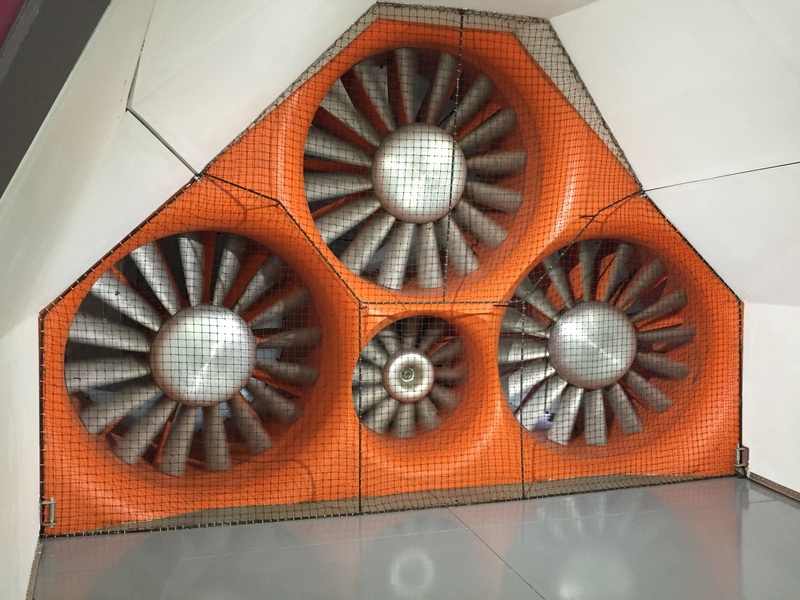 A word of caution, there is a time warp that happens inside the wind tunnel. What seemed like 20 minutes was actually 2 hours and before I knew it, I was packing up and heading home. Another word of caution, it’s a pretty solid workout. Bring a sweat towel and a bottle of water and treat it like any other workout. When the fans kick on, the moving air keeps you cool. When the fans stop, it gets pretty warm. My baseline was a Cervelo P2C with a Zipp cockpit, bottle between the arms, Zipp 808 front and a Hed disc out back. For the full Ironman, I run a bento box on the top tube and a flat kit behind the seat with a bottle on the down tube. My team kit is the Tri Free by Castille and the LG P-09 helmet. My baseline CdA was 0.258 which was actually pretty decent. What changes worked? Lowering my cockpit 2cm, moving my bars in 1cm, moving the downtube bottle from the down tube to behind the seat, removing the bento altogether and wearing the LG Course suit. What stayed the same? LG P-09 helmet ended up being the fastest for me. My new aero-optimized CdA was 0.237 which is a pretty solid improvement which works out to about 12 watts or eight and a half minutes over 112 miles. Theoretically, that means that instead of my original target of 200w, I could achieve the same time on 188w which works out to about a 5% lower Intensity Factor (IF), hopefully leaving a bit more in the tank for the run. The vast majority of the savings came from the LG Course suite. That purchase alone saved me 7 of the 12 watts. The rest of the savings were pretty evenly distributed over the remainder of the changes. I found it interesting that moving my elbows in 1cm was faster than dropping my bars 2cm. Was it worth it? Absolutely!! I am confident that I am racing with a highly optimized bike setup. The rest of my energy and focus goes towards the engine. Triathlon, cycling & multisport coaches committed to helping you achieve your personal best.